You are currently browsing the tag archive for the ‘Dallas Willard’ tag. How about Good Days? 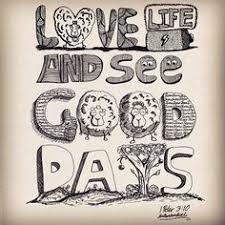 Do you See Good Days? Looking back on this week, did you see more good days, bad days, or so-so days. I think we all want to live a life that we can say we honestly love. To love our family, our work, our neighbors, who we are and what we do. We all wake up every morning and hope that we have a good day, that everything goes as planned, that we cross a few things off our To Do lists. That we have fun. That we enjoy success in all we do. but the face of the Lord is against those who do evil. So there it is. Five simple steps to loving life and seeing good days. 1. Keep our tongues from evil. Evil – profoundly immoral and malevolent; harmful or tending to harm. Keeping our tongues from evil means that we never say harmful words, only helpful words. 2. Keep our lips from deceitful speech. Deceit – the action or practice of deceiving someone by concealing or misrepresenting the truth. I think this young person loves life and sees good days. We already looked at the definition of evil. Here we are directed to “turn” from evil. This makes me think of repentance, which many define as turning from one type of bad behavior to a good type of behavior. I like Dallas Willard’s definition of repentance in his book The Divine Conspiracy, “Radically changing the way we think about something.” We can never really turn from bad behavior if we don’t radically change the way we think about that behavior. Good – to be desired or approved of; pleasing and welcome; appropriate to a particular purpose; possessing or displaying moral virtue; showing kindness. Psalm 100:5 says, “The LORD is good and his love endures forever.” From this verse I get the idea that God loves us and wants us to be happy. Our natural response to His love and goodness is to love others and be good to them. 5. Seek peace and pursue it. Experiencing peace with God makes it much easier to experience peace with our neighbors, co-workers and family. Pablo comes to mind when I think of these traits. Pablo came here to the Home For Needy Children in Oaxaca, Mexico, about four years ago after graduating from the FFHM Bible Institute in Baja, Mexico. He started working as a house parent for the little boys and later for the teenage boys. He also helped and continues to help with grounds keeping and maintenance. He preaches and teaches here as well as at rehab centers in the area. He is a fountain of encouragement and prayer for those men struggling with addictions. He does a lot of good. But that wasn’t always the case. As a young man he was himself addicted to drugs, did a lot of bad things, and rarely saw good days. His life was miserable. One day he came to the end of his rope. People had been telling him about Jesus and His great love and power, and how Jesus could give him new hope and a new life. Pablo asked Jesus to take over his life. Jesus did and Pablo became a new creature in Christ. He radically changed the way he thought about life and God. Now everyday is a good day and he loves his new Life in Christ.